For schools not currently running an Aboriginal or Torres Strait Island language program. Thank you for your interest in Marrin Gamu and Australia’s first languages. This song was recorded with children from five language groups with the aim of increasing awareness about the number, diversity and importance of Australia’s first languages. Over the next two years, communities from around Australia will be participating in the project by recording and filming the song in their languages. We encourage you to participate in the project, by working with your local Indigenous community to record and film the song in the first language/s in your area. We hope you will keep in touch as the collection of films grows. Aboriginal and Torres Strait Islander people are the custodians of their languages. For this reason teaching your local language must happen in conjunction with the local language custodians. First Languages Australia has produced some notes to help teachers establish relationships with their local language group/s. If you are interested in establishing an Indigenous language program in your school, please refer to the Australian Curriculum Framework for Aboriginal and Torres Strait Islander Languages for guidance. In the meantime, there are many ways that you can be teaching about Australian languages in your classroom. To assist with this, we have developed a few simple Marrin Gamu teaching activities around the following headings, which you can link to the Australian Curriculum. Language is a system of communication (written, spoken or signed) used by a particular community. What is the primary language spoken in your classroom? Where does it come from? Who speaks different languages in your classroom and what languages do they speak? Whose parents speak other languages? Do the students speak those languages at home, in other places or at school, and if not, why not? Do any students and their families speak Aboriginal languages and or Torres Strait Islander languages? 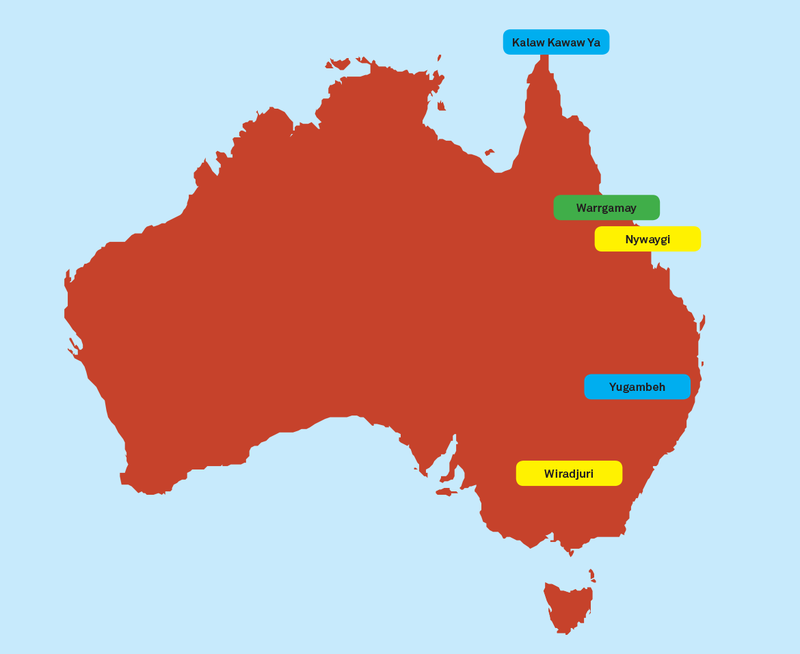 What are the local Aboriginal or Torres Strait Islander languages traditional to the local area or region where you live? Have a look at Gambay – Languages map to help locate the language of your region. Use Gambay to begin conversations with local people about the first language/s in your area. Place all the students/parents’ languages on a map. Make a list of all the languages that students and their families speak. Get the students to place each of these language on a map of the world. What is the primary language spoken in your classroom? Where are the origins of these languages? Use the world map (globe) and a map of Australia to label languages and where they originate from across the world and across Australia. Discuss where else these languages are spoken, as the official language and/or by large groups of people. Look at the Endangered Languages Map for more information about the Earth’s linguistic diversity. Watch Marrin Gamu with your class. Download the lyrics and work with students/parents to translate it into each of the languages in your classroom. Share the translations and have a go at singing them together with the backing track. Make a graph/table/chart of all the languages spoken in your class/school. Display these on a world map and an Australian languages map, showing the country where languages are spoken. Make a language tree/sea/river (or other idea appropriate to your local area). Have each student make a leaf, fish etc. with the languages they speak written on it, and add each to a whole class tree, sea, river or other landform, flora or fauna appropriate to your local area. Add to your display as you meet different people and hear different languages. Celebrate these differences through positive conversations and interest in how languages work. Aboriginal people were living and speaking on this land for tens of thousands of years before English was spoken here. Some Aboriginal people still speak their traditional languages daily-others do not. Prior to English becoming the most widely spoken language in Australia Aboriginal people were usually multilingual, speaking many languages including those of each of their parents as well as the languages of neighbouring regions. This is still the case in some parts of Australia and many children speak a number of languages when they are young and begin to learn English at school. Around most of the world it is usual to be multilingual. Brief background reading on bilingualism for the teacher: Washington Post article, By Valerie Strauss October 24, 2014. What are the benefits of being monolingual? Are all languages the same or are they able to say different things? Can you think of anything that the local Aboriginal language might be able to tell you about your region? Some Indigenous communities are happy for people outside the community to learn their language, others are not. Can you think of reasons why? Students watch the video together. How many first languages does Australia have? What are the languages around your local area? Does anyone know the names of these languages in your area? Are there any places in your local region that might come from the local Indigenous languages? You may like to look at Gambay – Languages map for reference. Please note: this map is a guide only, your Indigenous students and/or your local Indigenous community may have different information. First Languages Australia is pleased to receive feedback regarding the language names, spellings, relationships and placements on the map. Encouraging students to identify and share their own connections to particular places that are special to them and talk about why they are important e.g. what they do there, how it makes them feel etc. Inviting traditional custodians and local Aboriginal and Torres Strait Islander people to talk about the importance of country, place and language to them. 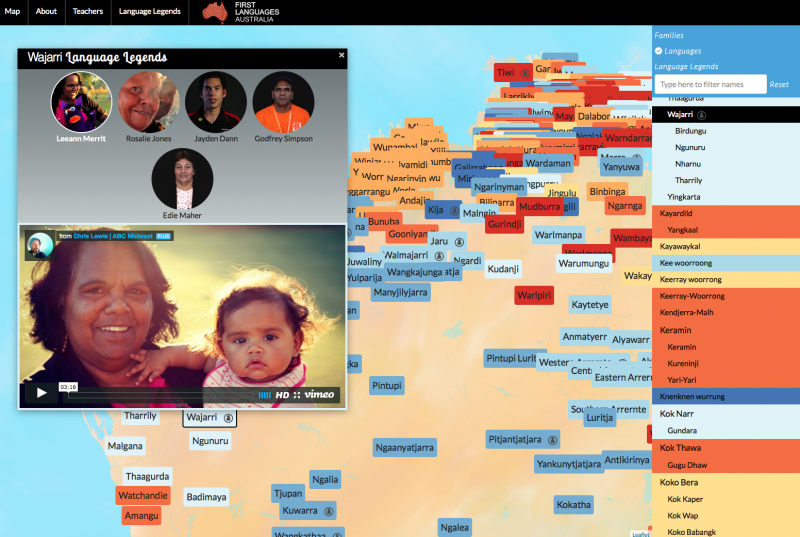 Working with Aboriginal people and Torres Strait Islander people to find out about places in the local area / region / state that have significance for them. Find out the language names for these places (where appropriate) and add them to your class maps. What things do you notice that are different to other maps of Australia? Discuss how this map was made. Who made it? Who informed the information on the map? What are some of the issues that could have come out of producing a map like this? Look at this map of where all the languages in the song are from. Does anyone know the names of the Aboriginal language for this area? How might you find out? Who could you talk to about the local languages situation? NB: Be sure to contact as many Aboriginal and Torres Strait Islander people, families, groups and organisations in the local area to talk about the most appropriate language/s to be used in your area or region. Translate the song to English and sing it together. Download the lyrics and sheet music. Translate the song into another language spoken by one of your students and sing it together. Add those languages to a map (you may need a world map to do this). Break the class into groups with each singing a language and taking turns – just like in the video. Add actions and expressions while singing the song. Make flash cards and play games e.g: bingo, matching games, concentration, and create crosswords puzzles using the body part words. Have a student lie down on butcher’s paper, or stand against a whiteboard and draw around them. Work with students to add the appropriate labels for the body parts included in all the languages spoken in your classroom. Aboriginal and Torres Strait Islander people are the custodians of their languages and for this reason teaching your local language must happen in conjunction with the local language custodians. If you have the a relationship with your local Aboriginal or Torres Strait Islander Community you may like to work with them to translate Marrin Gamu into your local language. It is important to recognise that payment for this service may be appropriate. For guidance on establishing these relationships refer to Gambay Teacher’s notes, or to the Australian Curriculum Framework for Aboriginal and Torres Strait Islander Languages. Translate the song into the local language with the help of local Aboriginal or Torres Strait Islander people. If you are working with your local language group to translate the song, refer to the notes for ‘Indigenous Language Programs‘ for information on recording the song for submission to ABC Splash’s Marrin Gamu Competition. 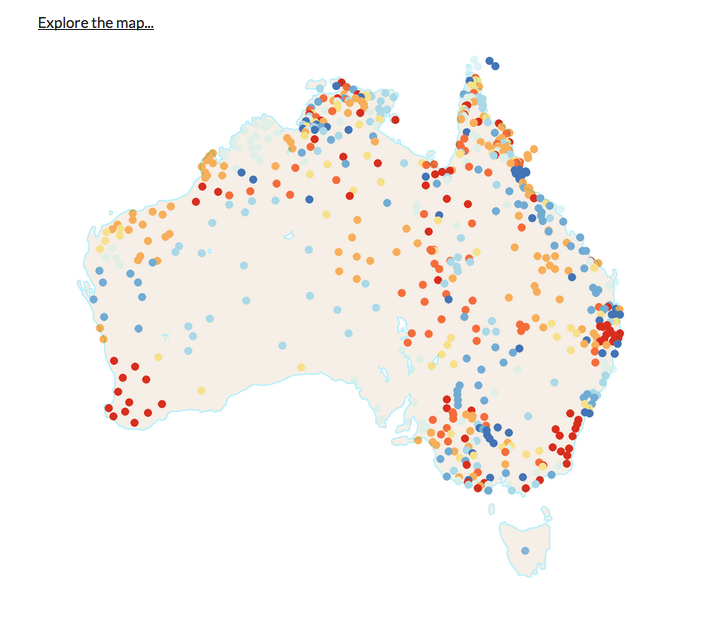 First Languages Australia has collaborated with regional language centres nationally to develop a map of Australian languages that reflects the names and groupings favoured by community. The map, titled Gambay, is a spectacular resource for students, parents and teachers and includes teacher’s notes across subject areas and curriculum links P-10. Language workers from around the country have contributed video profiles that are attached to their languages to give faces to Australia’s first languages and help bring people in their regions to an understanding of why these languages are important. Gambay is an ongoing project that currently lists 795 languages that can be broken into 291 language families. The map has been designed and produced in a way that allows language centres and communities to update information as they require. Please note: this map is a guide only, your Indigenous students and/or your local Indigenous community may have different information. First Languages Australia is pleased to receive feedback from community members regarding the language names, spellings, relationships and placements on the map.